Are you unhappy with the thickness of your lawn? Did you miss the opportunity to over-seed this past winter? I am going to personally try this technique this year. My dog has been very detrimental to the success of my back lawn. 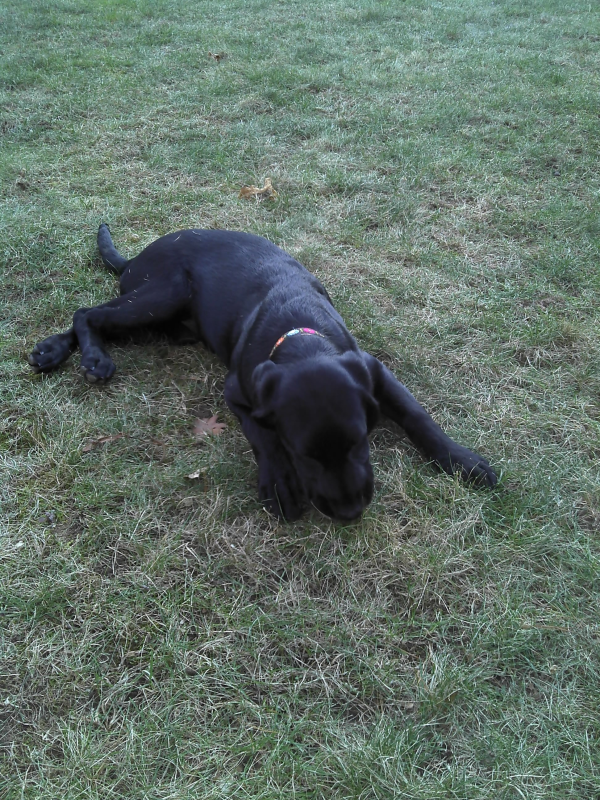 She is an energetic black lab that becomes obsessed with retrieving her tennis ball. How can I resist? She is getting great exercise and I enjoy watching her instincts take over. She will run full speed and then throw on the breaks ripping up turf the whole time as she reacts to the bouncing ball. Here’s the idea. As winter sets in spread grass seed heavily (make sure you are matching the seed type to your site conditions Click here for seed types) over the existing turf you wish to thicken up. As the ground freezes and thaws over the next few months the seed becomes embedded into the soil. As temperatures rise in the spring the seed is already sown, right? Here are some potential benefits. Grass starts growing before the need to apply pre-emergent crabgrass control which would nullify any post seeding activities. You do not need to worry about timing. The seed will already be embedded as weather turns and soil temperatures rise. Getting some early sowing will help the grass achieve some better root depth and density before the onset of summer. Seed stays to wet over the long winter months and simply rots out. Seed continually gets wet and dry killing the seed. Soil does not thaw and soil never embeds itself. My feeling is that seed is pretty inexpensive and it is worth the effort. Any opportunity to thicken the turf will save you money in the long run on trying to eradicate un-desirables plants such as crabgrass….. Please comment with your experience, questions or thoughts!